Instant Pot Italian Chicken Marsala is super easy to make. 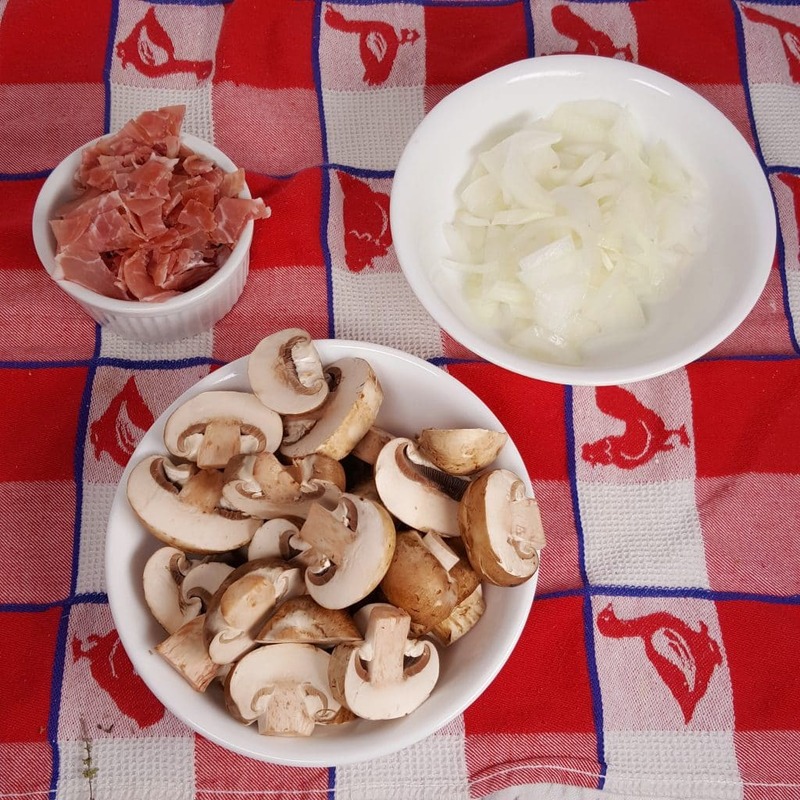 The Prosciutto and Marsala sauteed Mushroom and Onions, soars this meal to another level. Get ready for a delicious Instant Pot Italian Chicken Marsala dinner that you can serve even the pickiest of eaters. Cooked in a rich and savory Dry Marsala Sauce, this Restaurant quality meal is perfect for a dinner party. You will be the star of the show. The Cast of Ingredients for this Instant Pot Italian Chicken Marsala are few. It is a simple recipe Italian/American dish that quickly cooks on the stove. Using the Pressure Cooker, keeps the kitchen cool and infuses the flavors into the Chicken, not just in the Sauce. Prosciutto comes from the hind leg of a pig. Like Bacon, Prosciutto is smoked and cured. It is raw ham and needs to be cooked. Using my water method (or in this case, Marsala Wine), you can render the fat, without worrying about burning the Prosciutto. Can I Substitute Bacon for Prosciutto? You can even render the fat the same way. When I make Bacon in my Cast Iron Skillet (which is like the best way ever!!! Really, try it. ), I always add water first. This will keep your Bacon strips nice and straight. Cremini Mushrooms, Wild Mushrooms, any variety you like will be delicious. Porcini, Morel and Oyster Mushrooms are great in this recipe. White Button Mushrooms are not recommended, as they have very little taste. 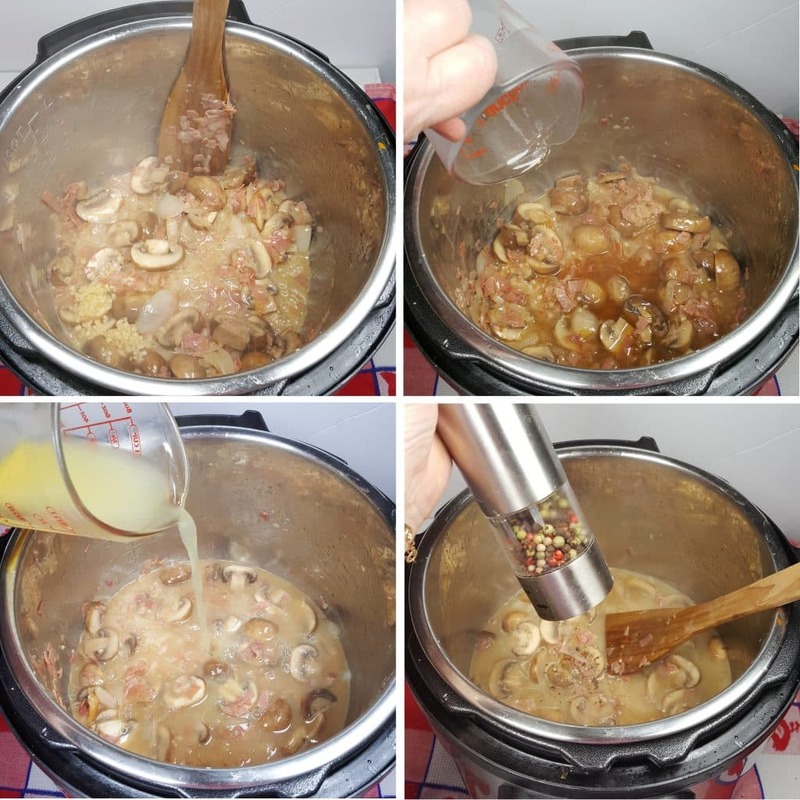 Another recipe that uses Wild Mushrooms is my Pressure Cooker Best Wild Mushroom Ristotto. Chicken Cutlets are just the breast meat that has been trimmed of fat and pounded into thin pieces. Don’t worry about buying expensive Chicken Cutlets. 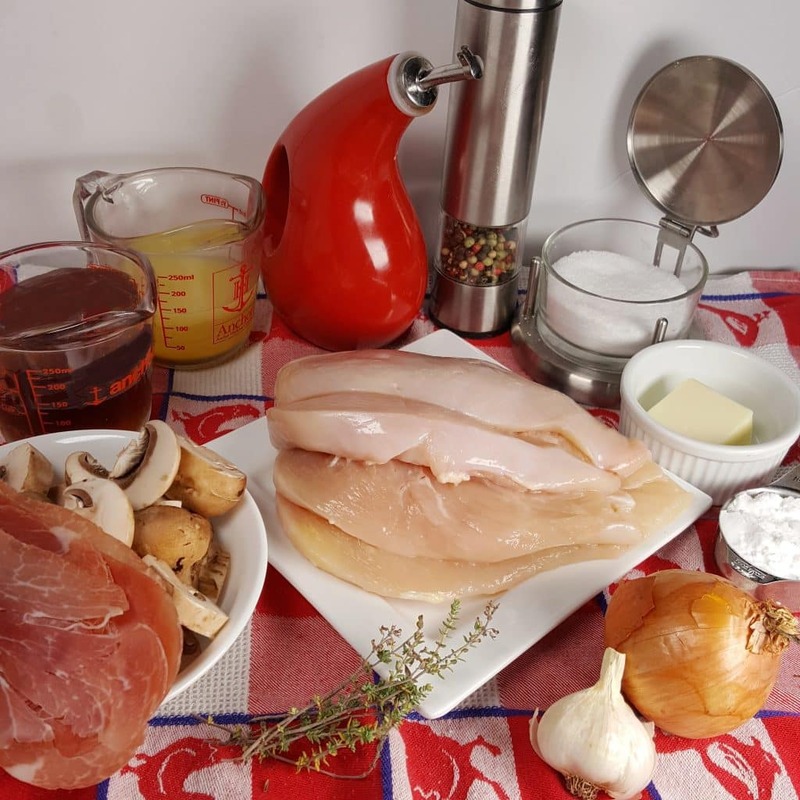 With a very Sharp Chef’s Knife, cut the Chicken Breast horizontally to make two long pieces. This Meat Tenderizer easily pounds the Chicken with little effort. It’s got one smooth side for pounding Chicken. The textured side, does a great job at tenderizing tough cuts of beef. You can make Pork Cutlets too, using this same method. Italian Pork Marsala is totally delicious as well. Cooking Chicken in a Pressure Cooker is quite tricky, especially with the White Meat Chicken. I developed this method a few years ago, which guarantees, moist and tender Chicken. Why Should I Coat Chicken in Potato Starch? The Potato Starch will protect the Chicken from drying out and becoming rubbery and tough. Potato Starch is very light and won’t gum up the recipe. Your Pressure Cooker or Instant Pot, will easily come to pressure, since Potato Starch is very light and not much is used. Using Potato Starch eliminates having to make a Slurry after pressure release and then Simmering to incorporate the Starch. That often times will cause Chicken to become over cooked. Plus, I’d rather not use flour in the recipe. Check out my Pressure Cooker Orange Pepper Chicken recipe. That might be the first time I introduced you to my Potato Starch method in the Pressure Cooker. The Chicken is not rubbery and is moist and juicy and cuts like Buttah! My incredibly delicious (I’m not kidding or looking for kudos) Air Fryer Crispy Honey Garlic Chicken Wings are really something special. 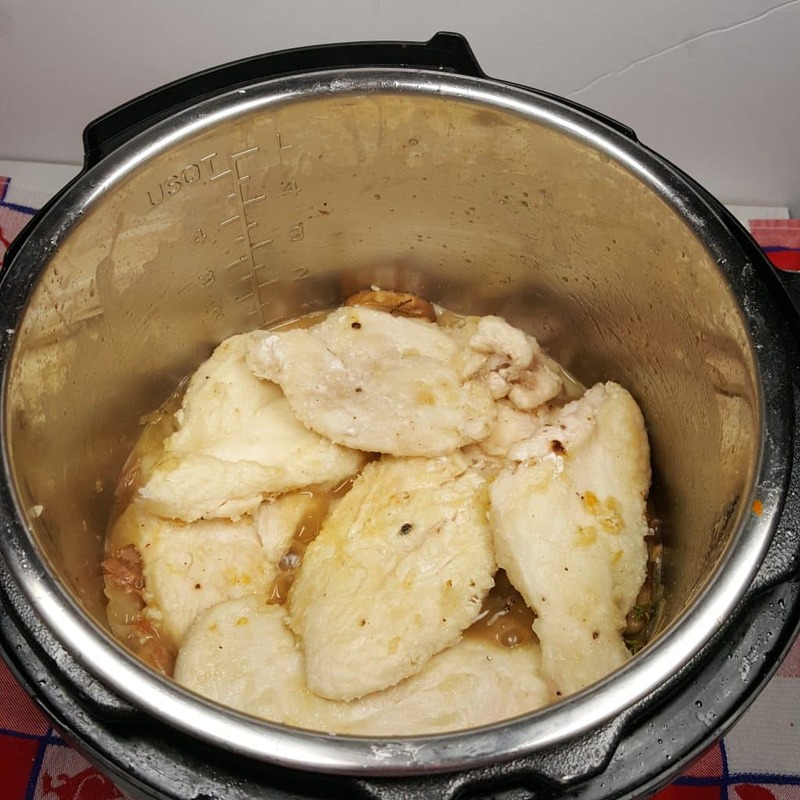 That recipe was created by Ed and I and it has turned out to be our favorite Chicken Wing recipe and very popular with the Air Fryer Community. This is not your normal Honey Garlic Wings at all. It is important to heat up the cooking pot before adding the Oil. This Rachel Ray Oil Dispensing Bottle is super nice. Make sure the Oil gets nice and hot! Sear the Chicken Cutlets on each side. Place the Cutlets on a Paper Towel and add more Cutlets into the pot to Sear. A couple minutes on each side, should do the trick. The Potato Starch will keep them nicely protected and retain all the juice. How do I Render Fat from Prosciutto? 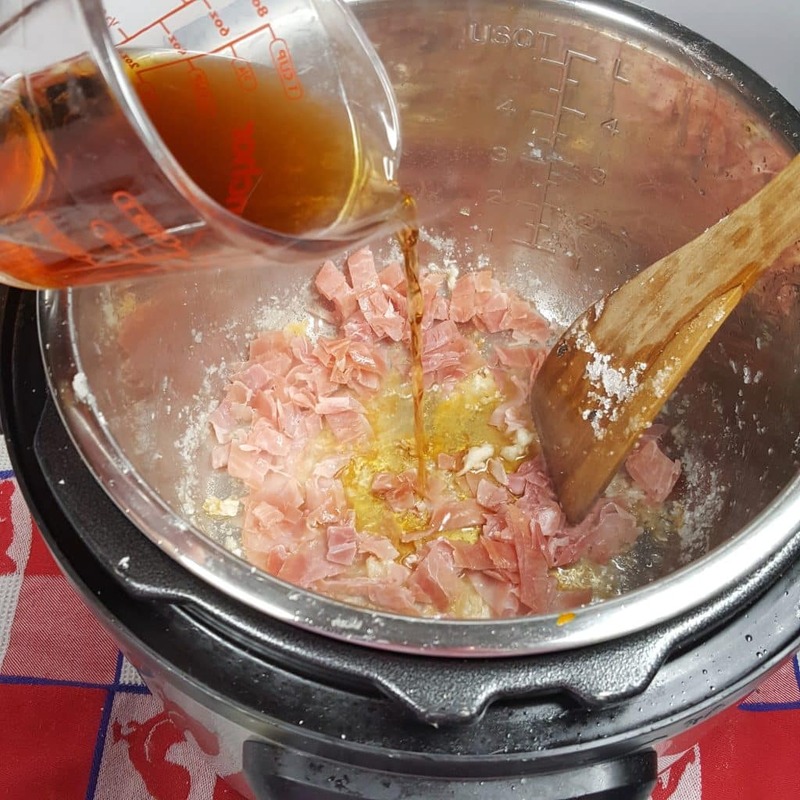 The Prosciutto is added to a very hot Pressure Cooker cooking pot (or skillet). In some cases, Olive Oil is added prior to adding Prosciutto (or bacon). The Prosciutto will almost immediately begin to stick to the cooking pot. 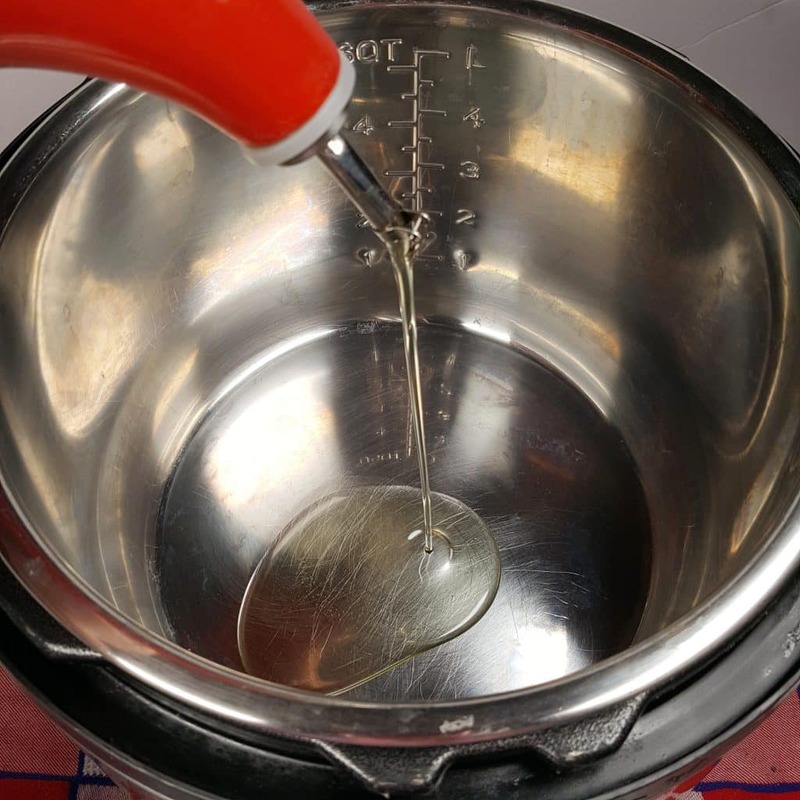 A liquid is used to prevent sticking, rather than using excess oil. Since I wanted to take this dish up to another level….. When I cook Bacon in my Cast Iron Skillet, I use Fresh Water. 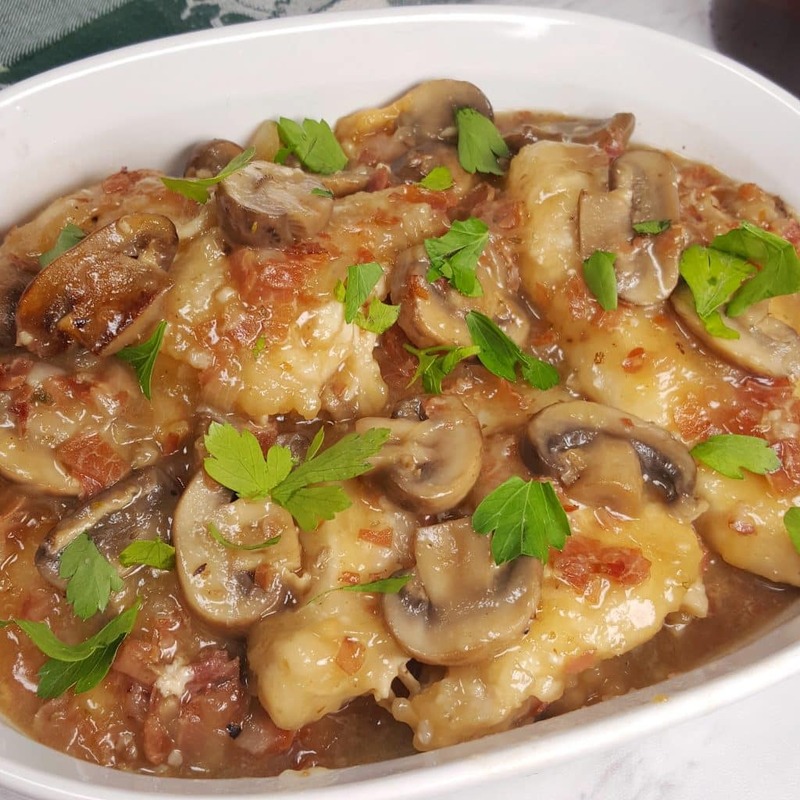 For this Instant Pot Italian Chicken Marsala recipe, what do you think we should use? Ah ha, Dry Marsala Wine. Why not? Right? Plus, it as it cooks down and reduces, it will become a thick and syrupy, much like what happens when cooking on the stove. Whenever I can use Wine or Chicken Stock, rather than Water, which can dilute the taste of the recipe, I opt for flavor over plain water. Not only will the Marsala Wine save the Oil calories, it will be key in deglazing the cooking pot. Dry Marsala gives a better depth of flavor to this savory recipe than Sweet Marsala. 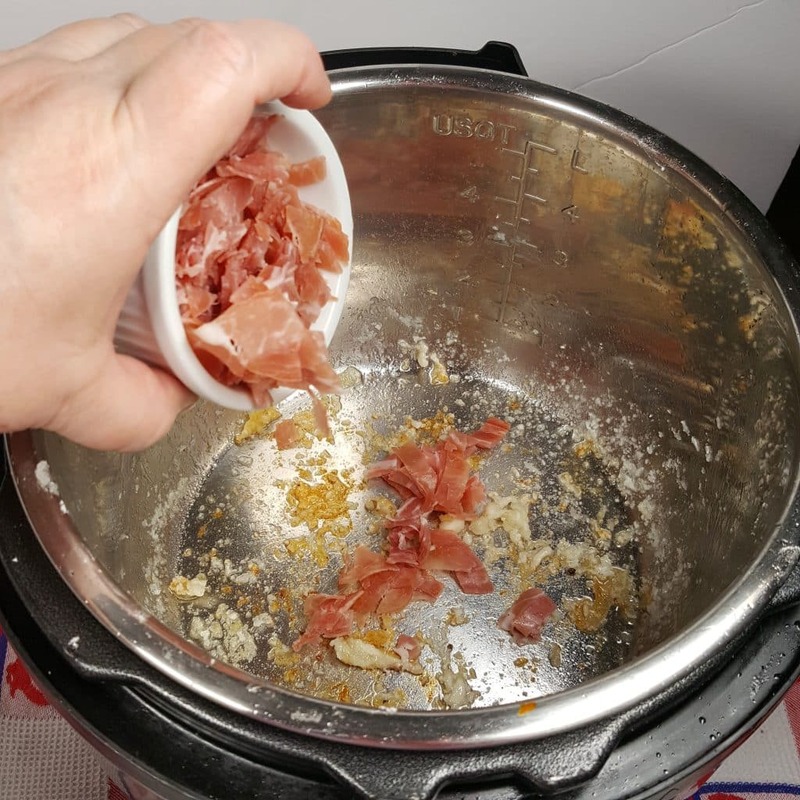 As you cook the Prosciutto, scrape up any brown bits that are stuck on the bottom of the cooking pot. I have a major fondness for cooking Mushrooms and Onions in Butter, Wine and Garlic. Especially for putting over a nice Grilled Steak! Oh Yum, Major Yum!!!! I’m salivating. It adds such a layer of flavor and really takes any recipe up a notch. 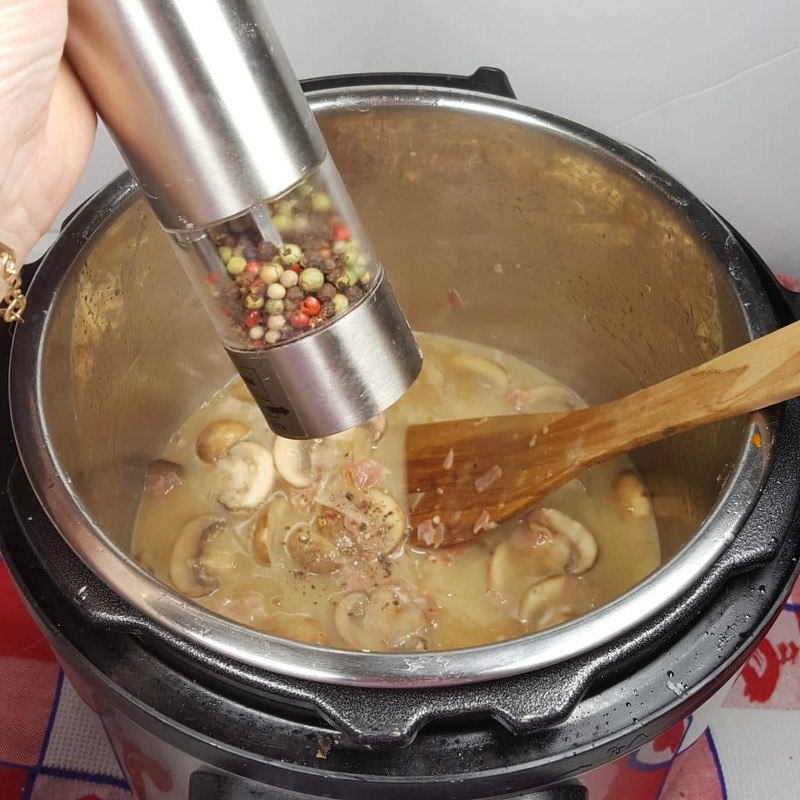 Check out my Instant Pot Beef Stroganoff and see if you agree! (It’s in my cookbook, so the link is not live). Try my Pressure Cooker Ground Turkey Stroganoff in the meantime and let me know if you notice an extra layer of yummy flavor and depth. The Onions and Mushrooms will give off a lot of liquid. Cook them until the Onions are soft and the liquid is kind of syrupy. Add the Fresh Minced Garlic. Add the rest of the Dry Marsala Wine and the Chicken Stock and mix through. If you don’t have any of my Homemade Bone Broth or boxed Chicken Stock, try using Organic Better than Bouillon Chicken Base. We always have a jar in the fridge. It’s the best I have found for true Chicken flavor and it is not filled with Salt and preservatives. If you use the Organic Better than Bouillon Chicken Base, add a whole round teaspoon of the Base to your water when mixing, for an intense chicken flavor. Depending on how much of the Salt and Pepper got shaken off with the Potato Starch, you may need to add more. Freshly Ground Pepper is always so much better than a jar of Ground Pepper. Actually, more often than not, I use Rainbow Peppercorns, rather than Black Peppercorns and grind them in my Electric Pepper Grinder. The Herbes de Provence adds another layer of flavor to this recipe. It may be the single ingredient in this recipe that takes it from really good, to incredible. Push the Cutlets down into the Marsala Sauce. If you love Marsala Sauce, you can always double the seasonings and liquid. Sometimes I make extra sauce and freeze it and then use it with my Pressure Cooker Mashed Potatoes. The Sauce in this Instant Pot Chicken Marsala will be perfectly thickened, so no need to worry about a Slurry! Pair this with my Instant Pot Mashed Potatoes or my Pressure Cooker Basic Risotto Recipe. Egg Noodles are yummy to soak up the Sauce too. Add a big spoon of Sour Cream or Yogurt to the Mashed Potatoes and OMG, so good. For another variation of an Italian scaloppina dish, try my Pressure Cooker Chicken Piccata. Using a very sharp knife, carefully butterfly Chicken Breasts and then cut into two equal pieces. Place each piece of Chicken between plastic wrap or waxed paper and lightly pound, until thin and even. In a shallow dish, mix together Potato Starch, Salt and Pepper. 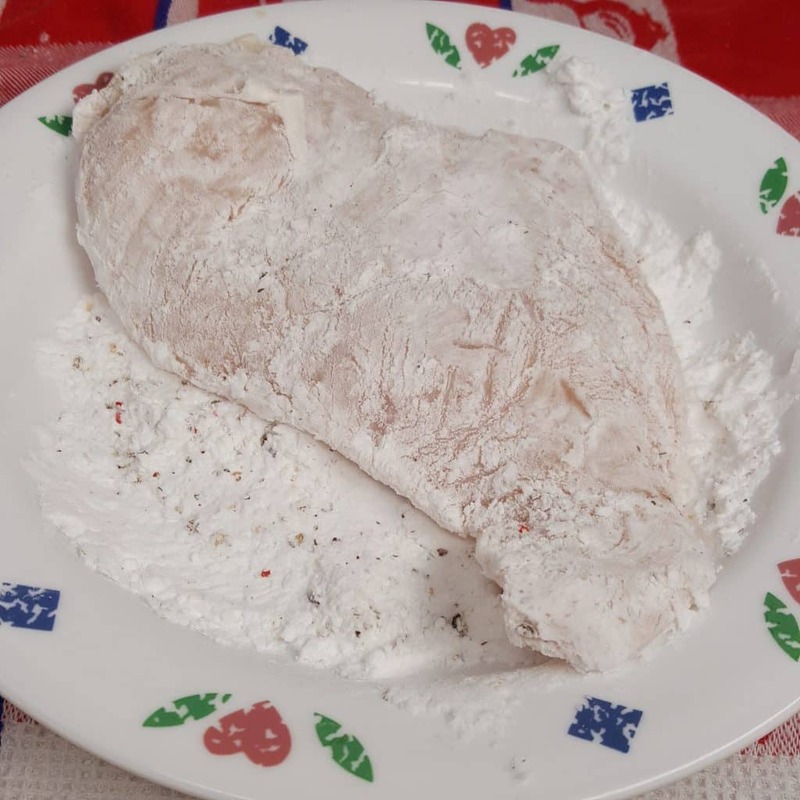 Dredge Chicken through Potato Starch mixture and shake off all excess Starch. Cutlets should only have a light dusting of Starch. Select Sauté/Browning and adjust to High. Allow pot to fully heat and then add Oil. When Oil is hot, in batches, place Chicken Cutlets into cooking pot and Sear on each side. Remove Cutlets to a plate lined with a paper towel. Adjust Pressure Cooker to Normal and add diced Prosciutto. Pour in 1/4 cup of the Marsala Wine and scrape the bottom of the pot to deglaze. Continue to cook Prosciutto to render fat. When liquid has reduced and the Prosciutto begins to brown, melt in Butter. Add 1/4 cup Marsala, Mushrooms, Shallots/Onions and Sauté until Shallots/Onions are soft and liquid is syrupy, about three minutes. Mix in the Garlic. Pour in the rest of the Marsala Wine and allow to bubble and reduce, for a couple of minutes. Turn off Pressure Cooker and add Chicken Stock, Herbes de Provence and Thyme. Return Cutlets to pot. Lock on lid and close Pressure Valve. Cook at High Pressure for 2 minutes. When Beep sounds, wait 5 minutes and then release pressure. Plate and Garnish with Parsley. Wild Mushrooms can be used. Use a good Dry Marsala Wine, one that you would enjoy drinking, for this recipe. Marsala Wine labeled "Cooking" Wine is not recommended. It is important to make sure to shake off all excess Potato Starch, so that you won't have a gummy Sauce. 1/4 teaspoon of Ground Thyme can be used in place of Fresh Thyme. 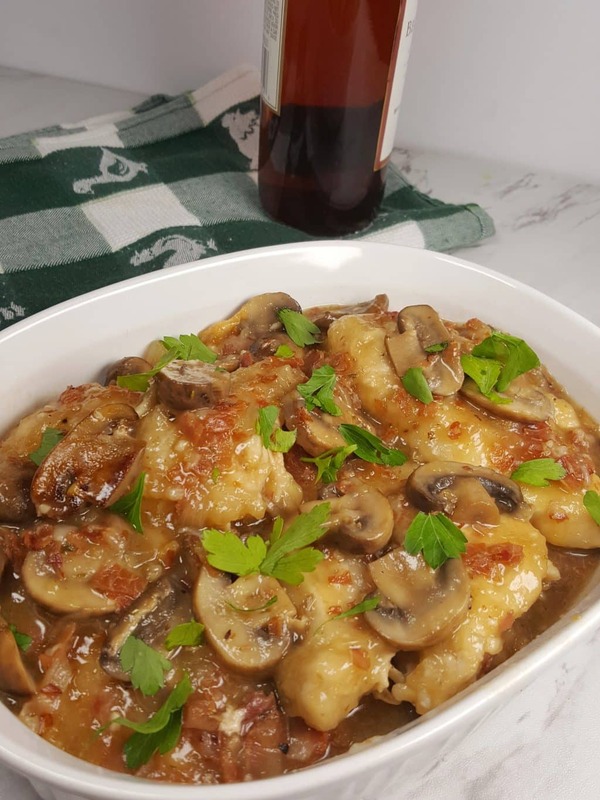 PIN this Instant Pot Italian Chicken Marsala Recipe! I just made this for dinner tonight. It was very good. I always prep all the ingredients before I begin. While the mushrooms and onions were cooking, I realized the minced garlic was still sitting on the counter. I read through the directions a couple of times and did not see them mentioned during the cooking steps. I added them at this point. Very good recipe! I made it tonight for the first time, followed the instructions to a tee and realized I had the minced garlic left after everything was done. Can you please edit your recipe for others who attempt this recipe. I just added the garlic at the end and it worked fine. Definitely a recipe I will keep with my favorites and make again. This is delicious! I followed the recipe except I used frozen chicken and bacon that we had leftover from the weekend instead of the prosciutto. Also, I can’t find potato starch (and it wouldn’t have stuck to the frozen chicken anyway) so my the sauce was a broth but still yummy over IP brown rice. I cooked it 10 min in the last step and the chicken was fantastic. This one is a keeper! 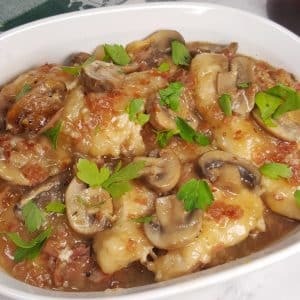 I just got a pressure cooker and was wondering how I could make marsala.This looks amazing! Is there an instance where you could or would actually use the pressure part or only the saute/brown part for this recipe? Also, I enjoy my marsala over pasta. Could you explain if we could cook the pasta in the pressure cooker at the same time? I am just not seeing the benefit of cooking this in the pressure cooker if we are basically mimic-ing a stovetop pan. I thought you could use the pressure cooker to saute stuff then cook over pressure all in the same effort, which makes sense. Sensational. Thank you not only for the dynamite recipe but also for your very clear and detailed instructions. The photos were a big help; I referred to them often as I cooked. 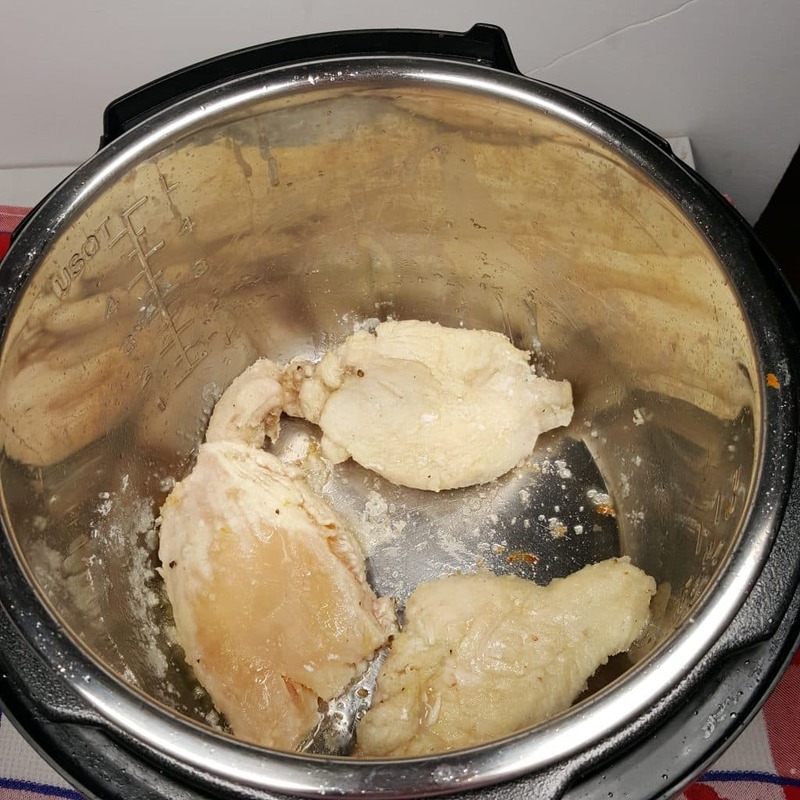 I’m fairly new to the Instant Pot and had read that chicken breasts tend not to do so well in the Instant Pot, but the chicken was tender and perfectly cooked. 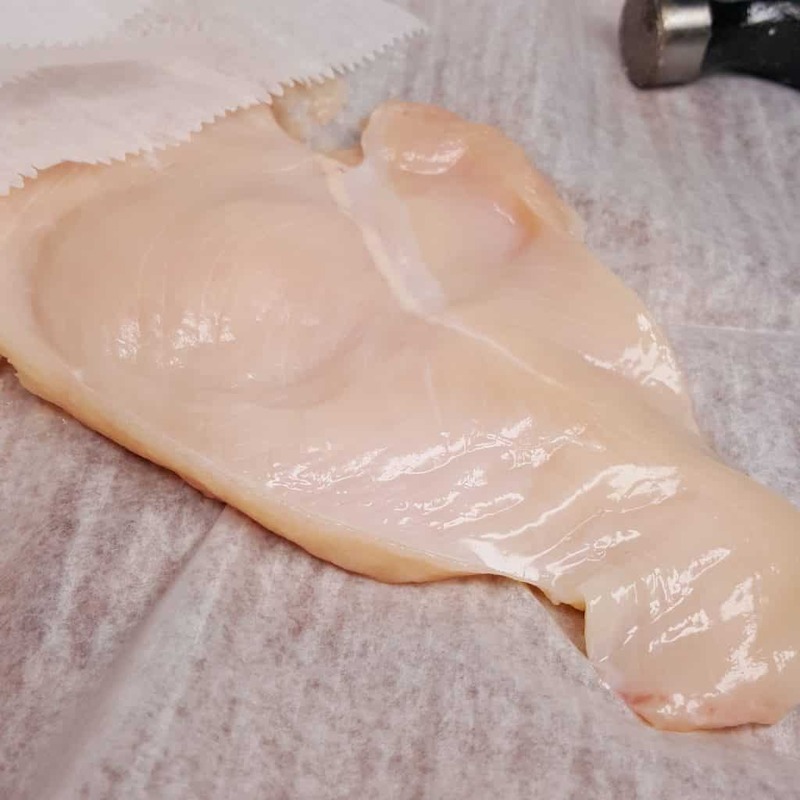 I appreciate your figuring out how to achieve this result, as my husband and I much prefer chicken breasts to thighs. 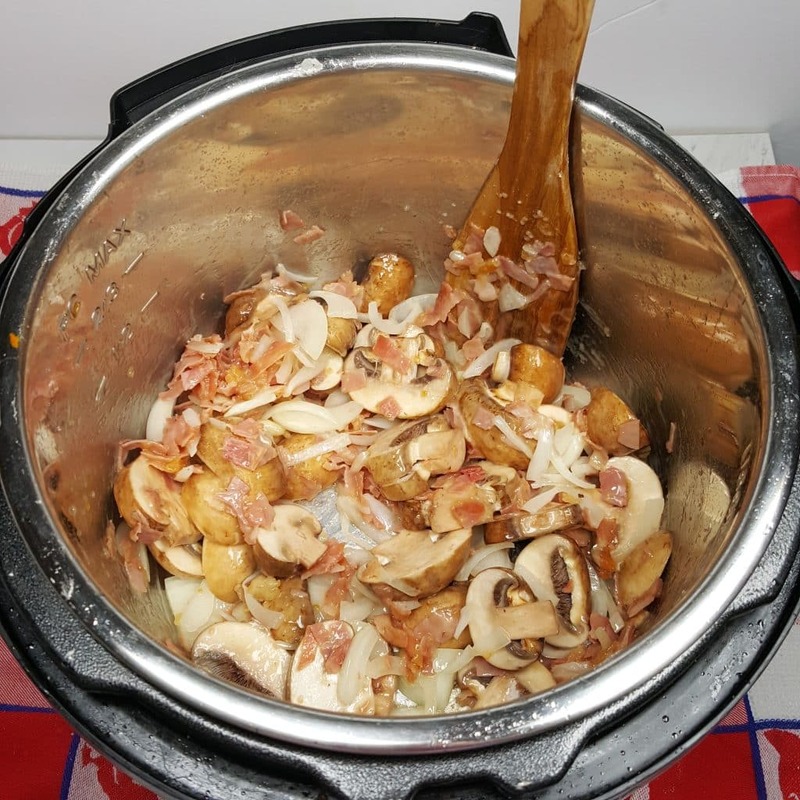 Hi – so, I am an Instant Pot newbie. I actually like the old-school style of cooking (long, slow, over the stove, etc.) which usually worked okay because I’m single and childless and have the time to putter around making big pots of things once and then eat through it for a few days. But a couple days ago, my best friend gave me the Instant Pot Duo Mini for my birthday (she texted me that “I heard it does everything but chill your wine for you”), and I’m kind of…not sure what to do now. I still want to try it out – if nothing else, the fact that I can cook beans in minutes will be something I’ll use – but I’m trying to figure out how to REALLY get use out of it. So I have Questions. 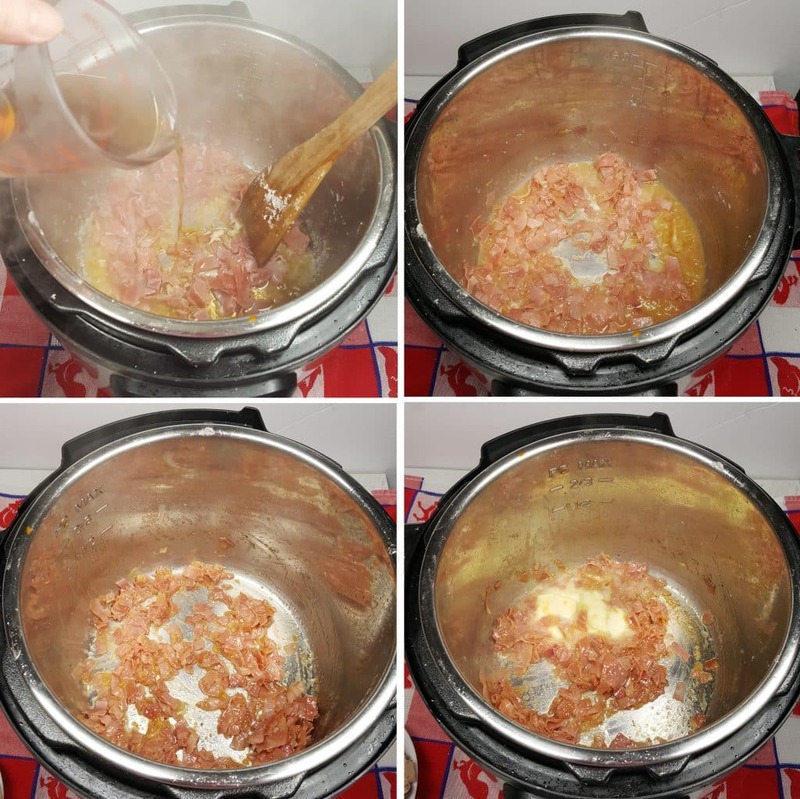 * For the Freezer Meals you have here – what do you do, just freeze everything at the marinade step, and then when you want to cook something you just pull it out of the freezer and drop it in the Instant Pot? How much time do you add to the cooking time that way? * I have the Mini. If I see a recipe for the regular-size, can I just simply halve the amounts? I’m kind of at sea. Help. I have to admit Chicken Marsala is my Achilles heel. I usually order it from a couple famous Italian chain restaurants…….. but this one really kicks up the yummy quotient few more levels. I’ve been enjoying cooking in my IP and my husband & I thank you for the recipes you’ve brought to our table. For those not finding potato starch @ their grocers, I purchased Bob’s Red Mill through Amazon. I received quite a lot and wasn’t sure what I was going to do with it all. I quickly learned how wonderful a product it is……I too use it for ‘flouring’ chicken, stew meat and pork before searing. I’ve found that doing that will not only keep meats juicy but also will thicken gravies beautifully without having to make slurries of cornstarch or flour. You just add a teaspoon or two, and voila, it thickens before your eyes! My DH had never had chicken Marsala & this was my first time making it. It was so-o-o good! Since it’s just the 2 of us I had enough for a 2nd meal. It was even better 2 days later. This after I couldn’t find the Marsala wine. (Went to 5 different stores & had to settle for the Marsala cooking wine.) I can’t begin to imagine how good it would have been with “real” wine. My sister is getting an instant pot for Christmas. This is her 1st request to make to learn how to use her IP!